We have plants in the ground! We planted the May Pole at the top of the field. See it on the horizon? Appropriately after dancing around the May Pole and celebrating Spring we’re starting to plant. We’re actually not far behind the rest of the valley since the weather has been frightful, with heavy rain falling far later than usual and even hail yesterday. We’ve been able to plant in the new “synergic beds” we built in the last few weeks in the Northern field, and we’ve also filled 2 of our 4 terraces in the Southern orchard field. Monika, our intern from Hungary who is an agriculture student, helped us plan beds for spacing and potentially compatible species combinations. We planted many of our own starts and a few we bought in various combinations to support symbiotic relationships within beds. In Hungary, Monika mentioned that many beneficial plant combinations in the garden reflect ingredients that are often cooked together, for example garlic, tomato and basil. We’ve been studying all kinds of combinations and planting accordingly. Our synergic raised beds were designed to maximize the surface area for planting, with all the roots (ideally) meeting underground to support pest resistance, nitrogen fixing and disease prevention. We also planted herbs and flowers at the ends of beds, like calendula and lavender, to attract desirable insects and hopefully protect from less desirable ones like ants. We covered new seeds and unplanted areas around the starts with dry straw to create a kind of skin which will hopefully keep moisture from evaporating off the bed and prevent weed growth. (Unlike in the Northwest, the greater risk here is dry beds from wind and exposure vs. wet beds with slugs and mold . ) We’ve also been considering copper wires in plant stalks to help support disease resistance, new spiral beds to make a sunflower labyrinth and more traditional row crops with an eye for crop rotation. 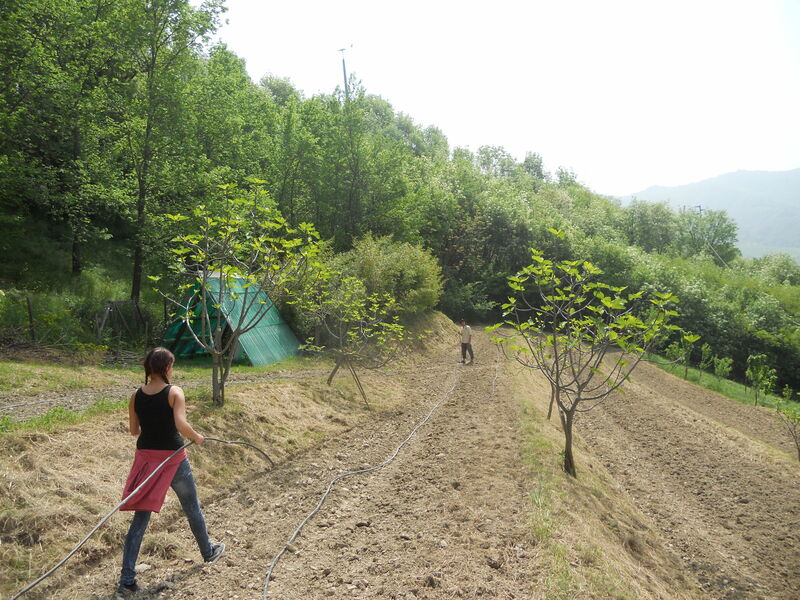 Laying drip irrigation lines in the orchard field. 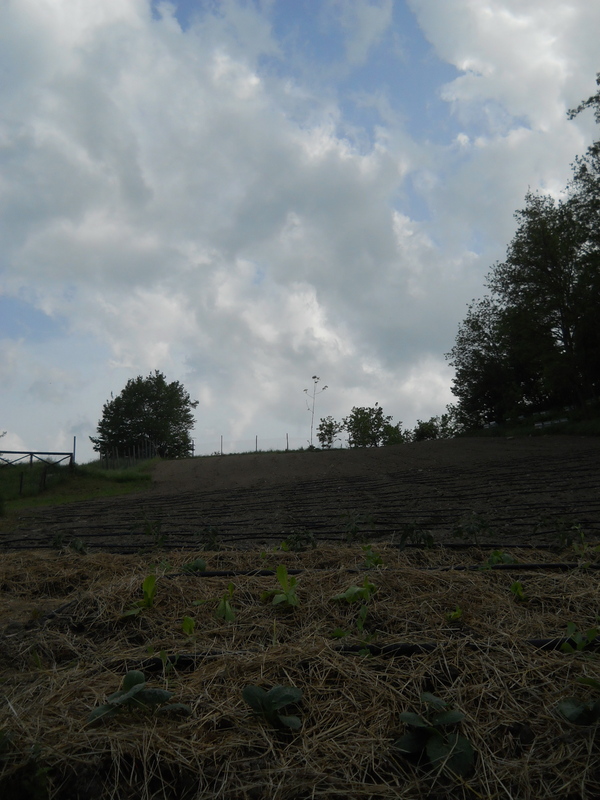 We’re planting squash and melon in these terraces. (L-R) Monika, Piergiorgio and Malik plant starts in the first raised bed. Those are our peas! 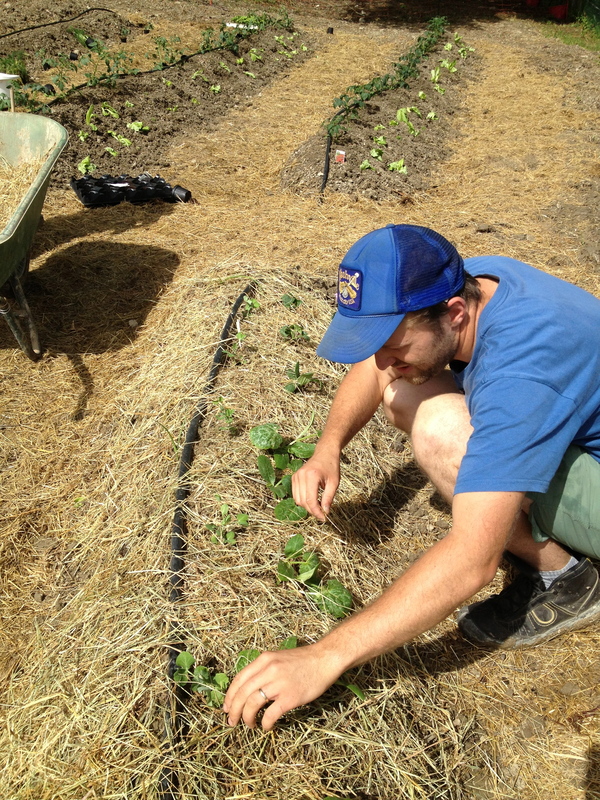 Here I am laying out the straw “skin” to protect the beds and new seeds from exposure. 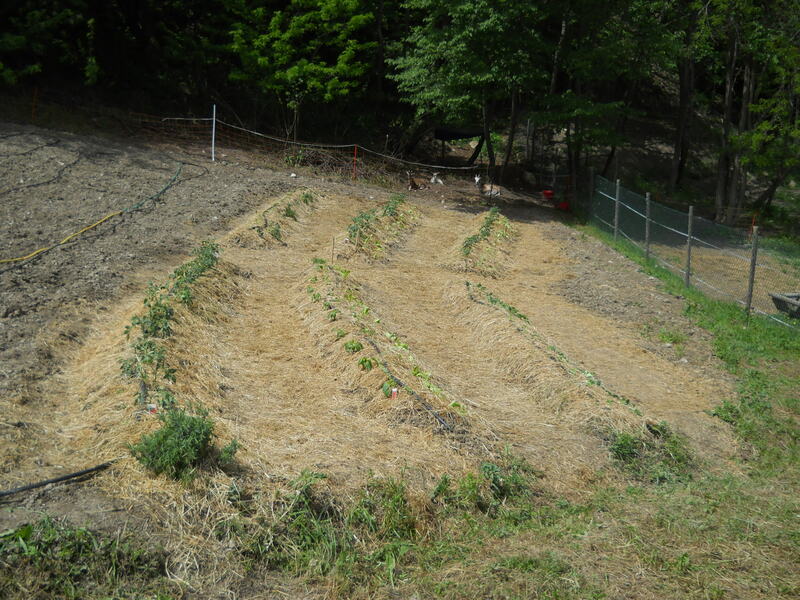 Here are our 6 freshly planted synergetic beds, with the goats grazing underbrush in the forest in the background. Love the pix! Hope those goats stay in the underbrush! Thanks Jane. Yes, it’s a lot to do but we like to think of it as a huge area to experiment! It is great to be able to catch not only a written account of what you’re doing, but also these pictures. Thanks! Indeed, though the papers are less likely to catch unknown diseases, dry out in the sun, etc. It’s so satisfying to see them thrive though!